Looking for a bathroom remodel in Dubai? Or do you need inspiration for your next design? Luckily, we’ve found an interior fit-out company that’s soaking in style! It’s often the smallest space in the house, but that doesn’t mean the bathroom can’t make a statement. From tiles to tubs, the bathroom has many design elements to enhance and consider –as it’s key to produce a space that is stylishly sleek, yet also practical. Here in Dubai, we’re spoilt with glamorous hotel bathrooms and luxury loos –yet, creating a spa-like oasis isn’t as easy as it looks. Bathroom renovations often lead to half-assembled disasters, burst pipes and poor designs –which is why you need an expert interior fit-out company to help. 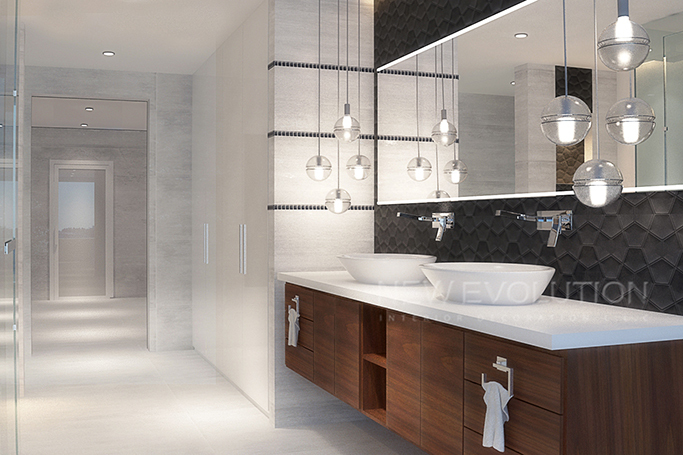 So, for a gleaming bathroom with clean lines, a flawless design and a high-finish, we recommend New Evolution. New Evolution creates full 3D visuals using 3D Max and Fusion programmes, to produce the perfect project for each client and space. This interior design company in Dubai specialises in generating modern bathrooms that have a sophisticated edge. From luxury lighting to decorative details and storage solutions, each bathroom is a harmonious blend of style and practicality. From a statement bath to a shower that disappears into the background, New Evolution can create the bathroom design that benefits you and your style; adding comfort to your lifestyle and value to your home. New Evolution takes care of all the messy details that surround a bathroom remodel. Their excellent fit-out service efficiently completes projects on time and to the highest standard. New Evolution assists in choosing and purchasing the right items, before installing the bathroom and completing all aspects of the design. From the demolition of existing bathroom to plastering, waterproofing, grouting, installing showers, mirrors and so much more. So if you’re planning a bathroom renovation in Dubai, contact New Evolution for more details. (hit the 'click to contact' button).